Home Housewarming Gifts Kikkerland Photo Mobile – A Picture Perfect Gift! Kikkerland Photo Mobile – A Picture Perfect Gift! 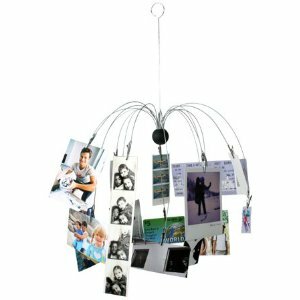 A Kikkerland Photo Mobile makes for a stylish and funky gift or home interior accessory. It has a capacity for 16 photographs and due to the clips used to hold the photo’s, you can hang photos of various sizes. While designed for and sold as an item to hold photos, let us not limit our imaginations! This item can be used to hold small art prints or perhaps you are looking for a way to hang your childrens’ masterpiece’s. If you are looking to add a low cost decorative feature to a room, you could always use this piece as a basis for a cool, modern mobile or simply add some squares of card in a color or colors you want to feature. The possibilities are endless and I am going to try to shut my brain cells off before this ends up being one of those “101 things you can do with……” posts! Next articleBodum Assam 2-Cup Tea Press – Tea For Two!